Rules exist to be broken, especially when it comes to our beauty routines. After all, the way we make ourselves up doesn’t need to be about looking the prettiest we possibly can, contrary to popular belief — it’s about expressing our individual style. As with most things in life, if it feels right, go for it. Practically anything can be pulled off with the right attitude, whether it’s forgoing the drawn-in eyebrow look or going heavy-handed with a bright pink blush. Bottom line: It’s all good. Real beauty comes from confidence within and being true to ourselves. So why should we limit ourselves by adhering to a well-known set of guidelines? Here are some of the most common beauty rules we’re tired of hearing. Please join us in tossing these tried-and-truisms out the window. Bustle content sponsored by Juicy Couture Fragrances. Break the rules with the new I Am Juicy Couture Fragrance. It’s 2015 and bold eyebrows are the thing. Long gone are the days of tadpole arches and over-plucking. Does that mean we're liberated from the excessive grooming? Not really! Truth be told, #browsonfleek can take some effort. In fact, we’d argue that full, Instagram-worthy brows take far more work than thin ones for those of us without naturally thick brows and a strong arch. If drawing on your brows on the regular isn’t really your jam, we say, rock what you got. Since your natural eyebrow shape is unique to you, leaving them untouched actually adds plenty of interest to your face. 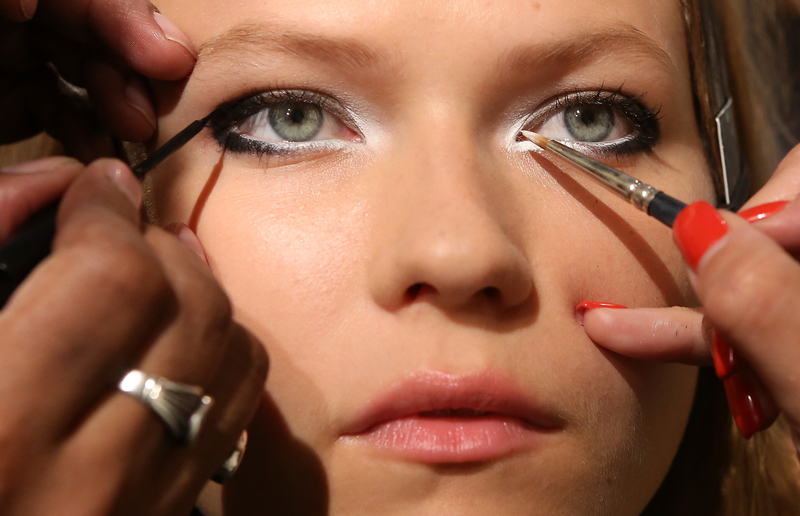 A perfectly drawn cat eye may be envy-inducing in that it requires some admirable makeup dexterity. But frankly, we love how downright rebellious smudged eyeliner can look. Nothing says “I woke up like this” quite like messy eyeliner. It’s only an added bonus that this look does not require as much of a steady hand, making it fairly easy to achieve. And if you feel like going for a thick smudge on the top and bottom lines? We’re cool with that. This is a no-rule zone. Desirable lashes are long, curled, and separated, right? That’s why mascaras boast their “clump-free” features. But is it just us, or are spidery, clumpy lashes downright smoldering? Wait, no, it’s not just us: We loved this aesthetic in the 1960s, and we still have a penchant for the spidery look. Clumpy lashes are just ultra-thick lashes taken to the next level — and we wholeheartedly support that. From coral to purple to true red, matte to shiny, bold lipstick shades are officially everywhere. But we’re repeatedly reminded that when it comes to makeup, balance is key: the old, "when you play up our lips, keep your eye makeup minimal" rule, and vice versa. While we're fans of that particular low-key look, sometimes you need some extra drama (on your face, that is). And what could be better than a deep red lip paired with a sultry gray eye? We’re certainly not stopping you. Go big or go home. Lining the bottom waterline of the eye with black eyeliner supposedly makes the eye appear smaller. That may be true for many eye shapes but regardless, we think it can make for a sophisticated and feminine look. Especially with a smoky eye, just one swipe can seriously upgrade your look. We recommend sticking with a waterproof formula to avoid fading during the day. (Not a rule, we promise! Just a suggestion). Blush is somehow supposed to give us a natural, healthy-looking glow without actually being detectable. But with so many stunning candy-hued shades out now, must we practice restraint? Nope. A bold pop of color on the cheeks can be downright stunning. It’s no wonder bright cheeks are such a runway staple throughout the seasons. There seem to be a lot of rules within this category: soft pink for pale skin, shades of plum for dark skin... and so on and so forth. While that’s all well and good, don’t let it completely stop you from wearing what colors you like best. If you feel like matching your #FOTD to your shoes, we endorse that. Even if it means (gasp!) blue eye shadow on your blue eyes. Wearing perfume is supposed to make us feel sensual, yet subtle. (Or something.) Frankly, a little dab of “the usual” on the wrist and behind the neck bores us to death. Switch it up! If you’ve grown accustomed to delicate, barely-there scents, try experimenting with a bold signature fragrance.